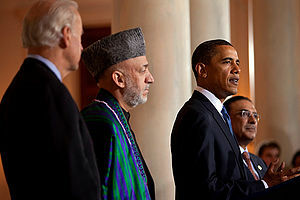 Who Is The President Protecting When He Apologizes To Karzai? In predicatable fashion the Muslim extremists, fundementalists, radicals, conservatives, liberals, whatever label you want to call them, are demonstrating and using violence to show their displeasure over the burning of pages of the Quaran at the airbase. As of this writing a number of civilians have been killed along with two U.S. servicemen. This is truly nuts. But, hey, that’s just my opinion. Listening to the pundits on the networks it seems the defense of the President for formally apologizing to Afghan President Hamid Karzai was to save American lives that are over there. I’m no diplomat nor some potentate of international politics but there’s something not right here on a couple levels. First off, why is the President apologizing specifically to Karzai? Ok… I suppose given the transgression was committed in Afghanistan one might think we need to grovel before the leader of that country. But given this offense is alleged to be against the holy doctrine of the entire Muslim religion, if there is any apology to be made should it not be aimed at the Muslims of the world in some form? President Karzai just barely represents the people of his own country politically; I don’t recall him being a religious leader. Perhaps in the least President Obama should have lent some apology to a local religious leader, or some more internationally acceptable Muslim leader. In fact, maybe all he needed to do was apologize to U.S. Muslims given the offense was carried out under the auspices of the U.S. government (even though it is being said the “culprits” were NATO troops), of which U.S. Muslims are citizens. Secondly… about this idea that the President was apologizing to protect our troops. The presumption is exactly what happens in situations like this where we, the Great Satan, offends some Muslim belief… “extremists” will demonstrate in the streets which begats violence and subsequent death of civilians and foreigners. But let’s think about this for a moment. Aren’t our troops over there specifically in harms way to assure peace and freedom anyway? Is not our military engaged in daily missions that take them into firefights with the Taliban, Al Quada, and other such “extemists”? Isn’t part of the reason our troops are there in the first place (besides trying to kill Bin Laden) is to take the war against terrorism directly to the terrorist havens and away from America? So is the President suggesting that unless he apologizes (grovels) to Afghan Muslims that our troops (and civilian contractors) will be in any more danger than they already are? Let’s go a step further along this same line. Given the Muslims that are upset are Afghan civilians in general, would not the Afghan police or military be appropriate to handle that? After all, aren’t we about ready to turn over the country to them in the next year or so because they are trained to protect themselves now? Why is Obama expressing his own personal deep regret when he should be passing on the deep regret of the American people? Also, was not the holy book of the entire Muslim religion alleged to have been desecrated? Why are apologies being extended to only Karzai and the Afghan people? So, Obama is now casting blame and treating this event as some sort culpable criminal incident requiring a formal investigation? Why not just say it like it is.. some personnel inadvertantly burned holy documents, not out of malice but out of ignorance. We will correct that in the future. Why make it sound like the whole thing is criminal? Here’s a final thought. To apologize means you want to make clear the taking of responsibility for having caused offense to another. What makes an apology work is the sincerity by which it is given. In essence the President has apologized… “because we don’t want you harming Americans we are apologizing for offending your religious doctrine.” Thus, the apology itself becomes an effort made under duress… “I don’t want you to harm me so I am apologizing to avoid that”. Rather than saying, “Look, whatever the outcome in the streets, an unintended ignorance of Muslim beliefs created an insensitive event that historically as a nation we do not normally do with malice toward any religion. We apologize for that event and we draw on the patience, understanding, and tolerence that are common with the teachings of all religions to shine a path of peace and good will for the future.” In the end the lumps we would take for saying that would be no different than the lumps we are taking now… but we would be perceived having greater sincereity… and not cast some criminal blame where it’s not needed simply for a scapegoat. Mr. President, I dunno who advised you on this one but someone messed up. This entry was posted in Politics, Politics & Religion, Religion and tagged afghanistan, Barack Obama, Hamid Karzai, NATO, Obama, President of Afghanistan, Quran, United States. Bookmark the permalink. If only your words would reach the ears of Mr President !! Thanks!! And cool blog you have there. Straight for the jugular of the truth!